Pepper vanilla: a delicate chocolate bonbon filled with almond and Jamaican peppery hazelnut’s praline (aromatic but not spicy) dark Ganache with Bourbon vanilla from Madagascar. 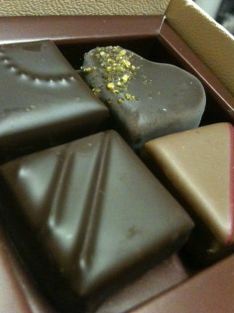 This complex indulgence is full of contrast, with successive flavours that ends on a chocolate note. I found it slightly odd to me – there was a kind of sweet peppery note that was edging on floral. Not something I’d pick for myself to get in a dozen box but OK.
Zesty Litchi: dark Ganache flavoured with litchi and raspberry pulp, with a milk chocolate coating. 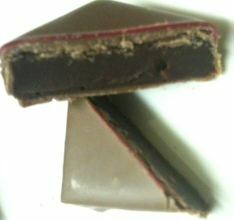 The sweetness of the milk chocolate and litchi is offset by the acidity of the raspberry. This is absolutely awesome. The sweetness of the milk chocolate and lychee is absolutely cut through with the sharp sour note of the raspberry. Yummy and too moreish. 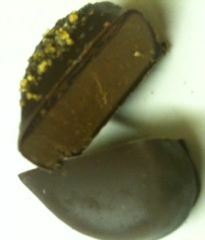 Lemony Galanga: a smooth almond praline incorporating dried and grinded Galanga root and fresh lemon zest. The fruity notes of the Galanga give freshness to the praline making this an utterly delectable and unique part of the collection. The Galanga, sometimes called the Thai ginger is part of those plants which have the reputation to be aphrodisiacs. The galangal can be found in fresh slices or dried, as a whole or a powder in the oriental grocery stores. The rhizome is often used in the South-east Asia’s recipes. It is lightly spicy and often replaces ginger. Its brown powder is peppery but very tasty. It reminds at the same time of cinnamon, rose and camphor. It is sweeter than ginger. Slightly weird after all the ganache. The lemon is set off against a praline and the galangal has quite a different flavour to ginger and so it comes across the palate differently. It’s slightly muddled for me but this is going to blow the socks off a praline lover with its zesty lemon, complex flavour and depth of flavour. 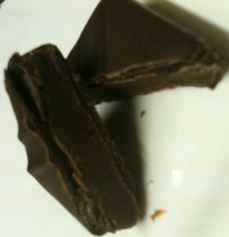 Woody caramel: Dark caramel ganache perfumed to the bandaged wood infusion. The expertise lies in creating the perfect caramel to create a luxurious balance of sweetness and spice, which La Maison du Chocolate has achieved to perfection. The real bandaged wood from the Antilles, sometimes called ‘human wood’ is the bark of a big woods’ tree from the tropical forests: the Richerias Grandis. It is also a product a 100% natural, valued for its vasodilators and aphrodisiac effects. The dark chocolate is interesting. 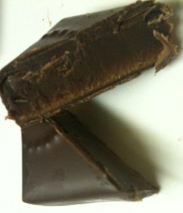 Slightly chewy but not sweet, the caramel does not overbalance against the dark chocolate. Interesting woody chocolate but not my top pick. The chocolate lovers duos is presented in an elegant scarlet and ivory box tied with delicate La Maison du Chocolat ribbon bearing hearts for Valentine’s Day.